For fans of the cult film the Karate Kid, it is a familiar pose. 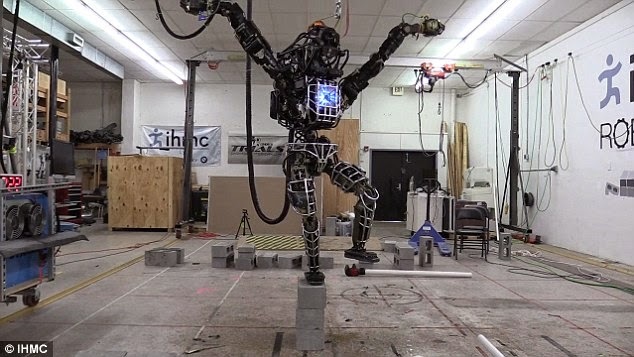 However, in the latest video from the US military team developing a two legged fighting robot, the buildup to 'crane kick' is seen in a new way. The researchers taught the robot to stand on one leg - recreating a key scene from the film in the process. The Atlas robot created by Google-owned firm Boston Dynamics is a formidable figure at 6ft 2in tall and weighing in at 330lb. The robot boasts 28 hydraulically actuated joints and stereo vision, and is one of the most advanced robots ever created.